Musculoskeletal physiotherapy is focused on your biomechanical and structural rehabilitation. With targeted goals to maximise your functional movement so you can return to normal daily activities. This type of therapy is most commonly used to address accidental injuries, sports injuries and resolving physical impairment due to lifestyle and ageing. 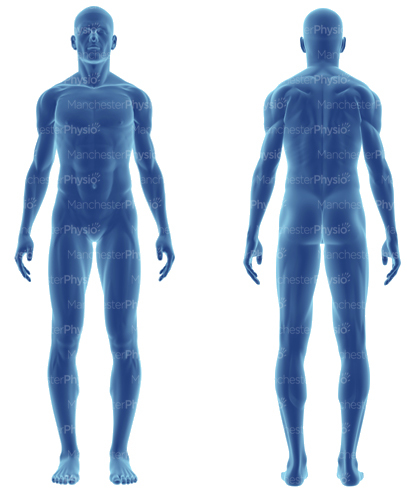 The physiotherapist will focus on the bodies’ main structures of bone, muscle, ligaments and tendons along with the connected systems of the heart, circulation and lungs. Treatment is tailored to the individual based on their initial assessment. Exercise plans and advice are routinely given following treatment and the number of treatments will vary depending on the patient’s progress in recovery. Our clinics are fully equipped with gym facilities and treatment rooms to allow our experienced physiotherapists to treat all musculoskeletal conditions, with gait analysis and hydrotherapy resources available if required. All our patients will be assessed to identify the cause of their condition so that treatment can be targeted, appropriate and effective. If you wish to know more about a specific condition or a symptom please click on the links blow to see a comprehensive list. For more information on how physiotherapy can help treat musculoskeletal injuries, or to book an appointment, please contact us via email at office@physio.co.uk or call us on 0330 088 7800.